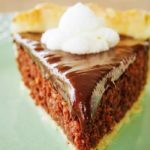 Chocolate coconut pie with rich cocoa powder in place of flour with a chocolate almond filling and chocolate coconut glaze. Delicious! Have you ever had the experience of imagining a new dessert while eating another? You know we love homemade pie around here. 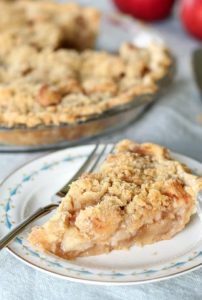 The idea for this pie came to me while I was eating the amazing pear pie with almonds and raspberries. The pear pie turned out so good (one of our favorites!) that I thought back to how it was made and wondered how I could change the ingredients, but use the same process. The first step is to bring out the almond flavor by toasting them. Toast almonds in a 350˚ F oven for 5 minutes. 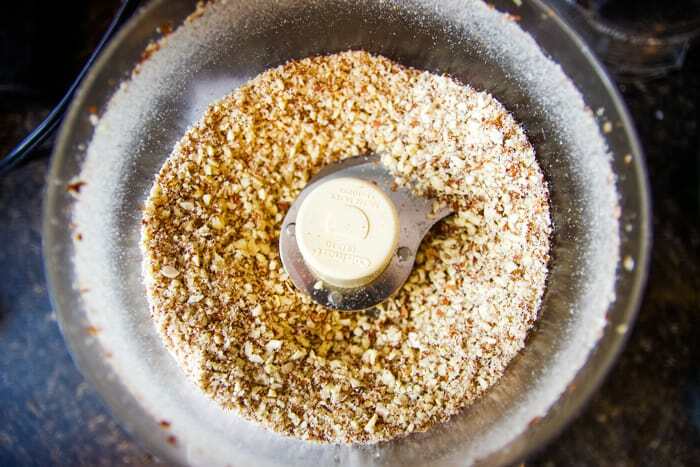 After removing from the oven, pulse the almonds for a minute using a food processor. Smaller sized almonds allow our batter to have a smoother texture. To the food processor with the almonds, add in the sugar, butter, flour, cocoa powder, eggs and unrefined coconut oil. Process the batter until it has the consistency of crunchy peanut butter. 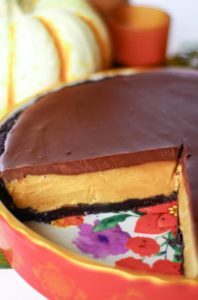 Couple notes about this... You can use butter substitute and flax eggs for a vegan alternative or coconut flour in place of all-purpose for a gluten free option. Also, be sure to use good quality cocoa powder (I like raw cacao for its antioxidants!) and unrefined coconut oil. Since our batter doesn’t include shredded coconut, we have to rely on the oil to give us coconut flavor. Refined oil has very little coconut flavor, so be sure to use unrefined. Spread the batter into a 10 inch unbaked pie shell and bake the pie for 40 minutes at 350 degrees or until the middle has puffed up and the edges are golden. 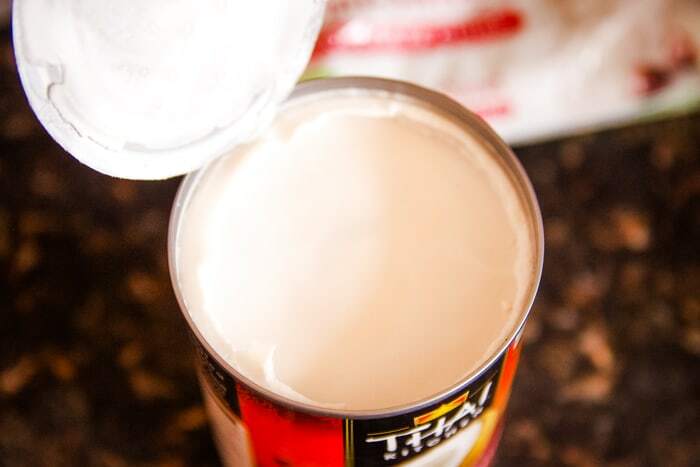 During the last ten minutes of baking, pull your can of cold coconut milk from the fridge. The refrigeration helps separate the thick cream from the clear liquid. We are only going to use the cream in this recipe. You can save the liquid for smoothies! In a small saucepan, melt 10 oz of semi-sweet chocolate chips, all of the solid coconut cream from the can, honey and coconut flavoring until you have a smooth fondue consistency. If you’d like more of a coconut flavor, feel free to add more than 1/4 tsp. 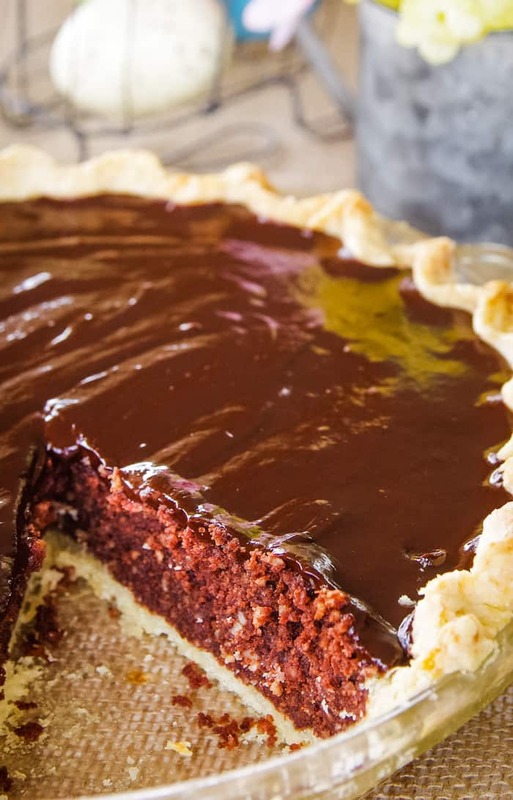 When the pie is finished, pour the chocolate glaze over the top and let it cool. If you work quickly, the glaze won’t begin to separate, and you can create a completely smooth glass look on top. I took too long to pour the sauce on as I fiddled with my camera, but it will still taste the same – chocolatey, coconutty, rich and delicious. I’m not sure I could think of another dessert recipe while eating this one. 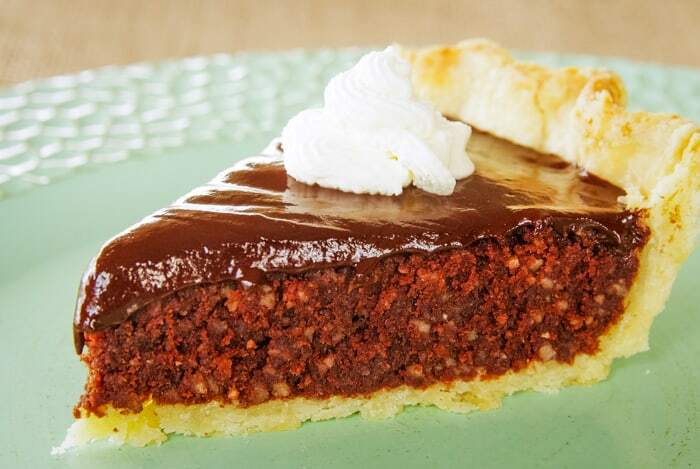 If you love dark chocolate like I do, this pie will blow your mind. I enjoy every bite and smile over the thought of sharing it with my family as we celebrate Easter on Sunday. Thank you Lord… for redemption, dark chocolate, and imaginations. 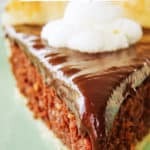 Can you make this coconut pie vegan? Yes. Use a butter substitute as well as flax eggs. 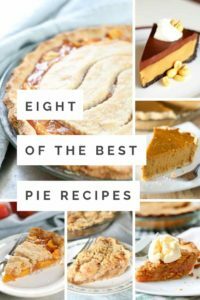 Can you make this coconut pie gluten free? Yes. In place of all-purpose flour use coconut flour. Also, make sure to bake it in a gluten free pie shell. Does it matter what kind of cocoa powder or coconut oil I use? Yes! You want to use a good quality cocoa powder. I use raw cacao. For the coconut oil make sure to use a unrefined coconut oil. It will give richer coconut flavor to the batter. How should I store this pie? 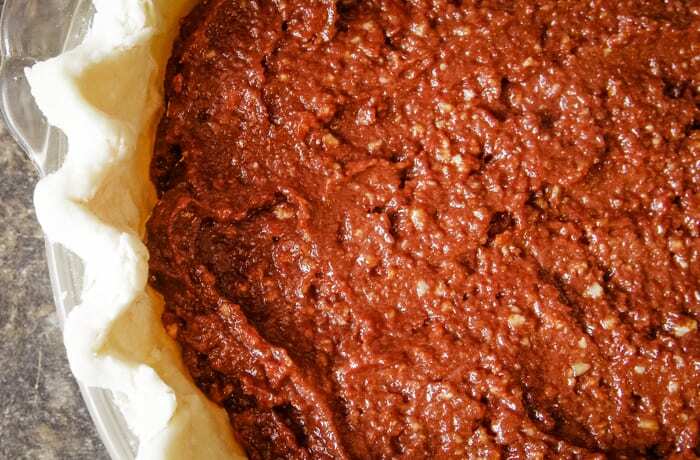 Unlike most, this pie is best when it is chilled. 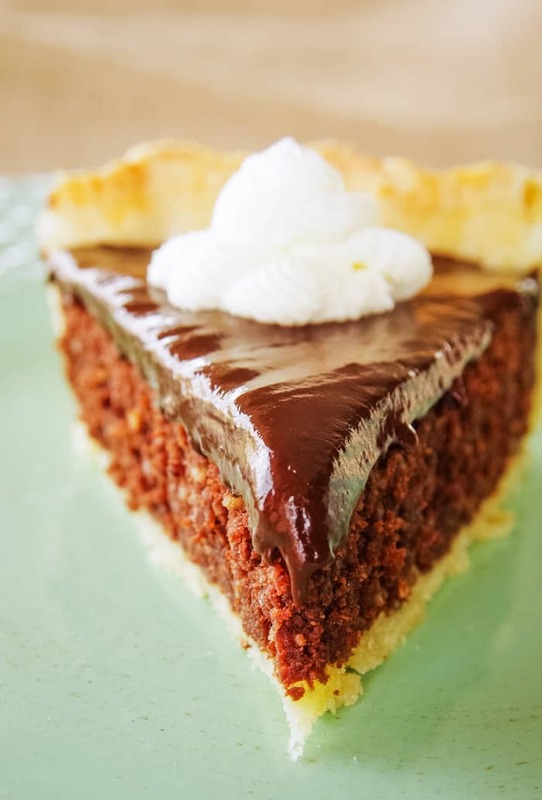 Dark chocolate coconut pie with a rich pie filling and thick dark chocolate glaze. 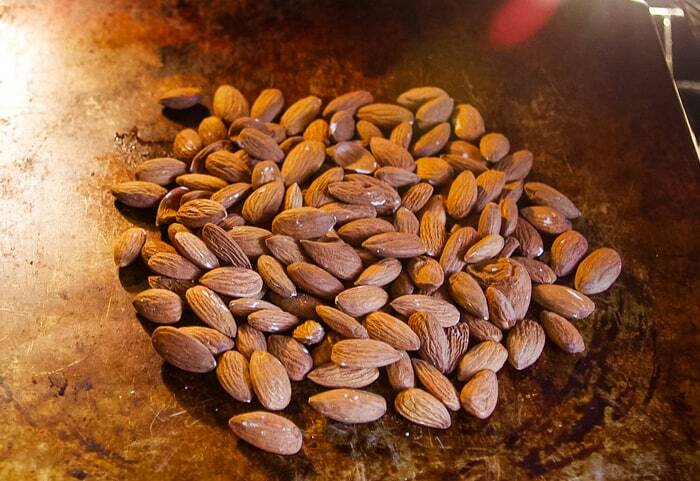 Toast the almonds in a 350 degree oven for 5 minutes. Pulse them for a minute using a food processor. 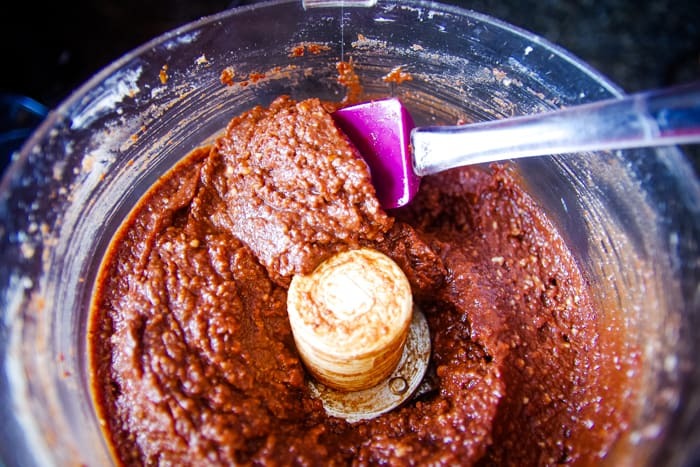 To the food processor, add the sugar, butter, flour, cocoa powder, eggs and coconut oil and process until you get a crunch peanut butter consistency. Spread the pie filling into a 10 inch unbaked pie shell and bake the pie for 40 minutes at 350˚ F or until the middle has puffed up and the edges are golden. 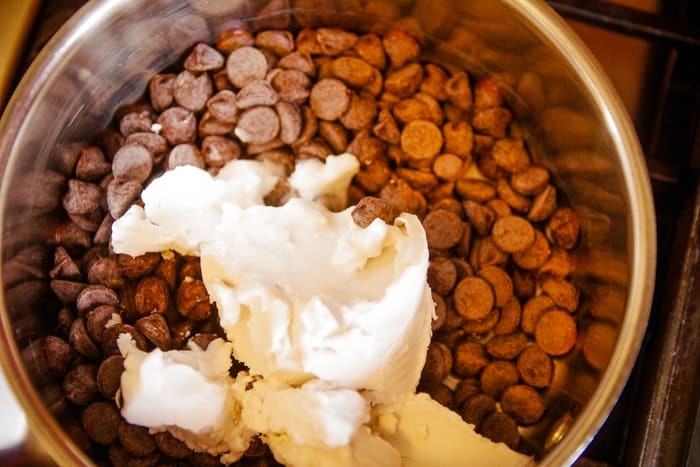 During the last ten minutes of baking, melt the chocolate chips, coconut cream from the can, honey and coconut flavor until you have a smooth fondue consistency. 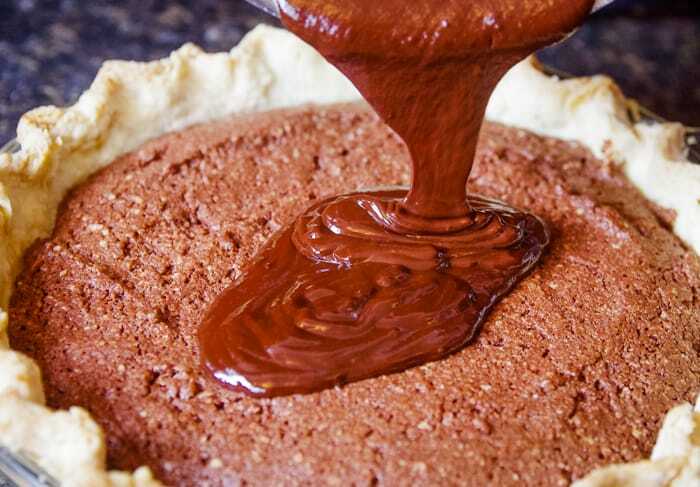 When the pie is finished baking, pour the chocolate sauce over the top and let it cool. 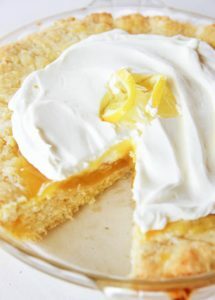 Serve with real whipped cream. Avoid storing the pie in warm temperatures. It stores best while covered and refrigerated.